Thank you to our major sponsor, Mildura Mazda for their continued support. This year is the third year that Mildura Mazda has supported us as Naming Rights sponsor. Check out the latest models of Mazda on Good Friday at the Community Picnic. 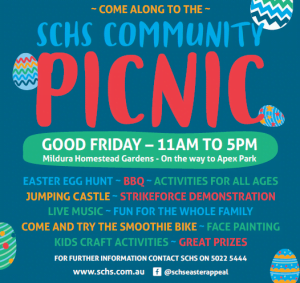 In 2019 we’re hosting a Community Picnic on Good Friday, 19th April. We’re encouraging the community of Sunraysia, and visitors to Mildura, to come down to the Mildura Homestead and join us an afternoon of activities and events, food and fun for the whole family. 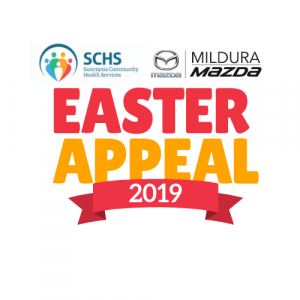 You can come down to the Old Mildura Homestead on Good Friday, 19th April 2019 and support our event with a gold coin donation. We will be rattling tins, and many of our activities will be for a gold coin donation. If you’d prefer, you can also donate online via MyCause.